Sasha Huber from Switzerland with Haitian roots and Petri Saarikko are a visual artist duo living and working in Helsinki (Finland). They have been working and exhibiting both collaboratively and individually in museums, independent art spaces and residencies around the world since 2000. In 2011, they initiated an independent art space, Kallio Kunsthalle based in Helsinki, Finland and since 2016 also in Wellington, New Zealand, directed by Petri Saarikko with over 40 curated exhibitions. In 2016 they developed the performance projects Remedies and Perejil with a multidisciplinary group of local performing artists, poets and musicians at the Le Centre D’Art in Port-au-Prince; of which Huber’s grandfather, Georges Remponeau, was on of the co-founder in 1944. This screening is presented in parallel with their exhibition Remedies and Perejil at AXENÉO7 (Gatineau), until February 25, 2017, where both are in residency, which was arranged by the Artists Association of Finland. Remedies is a collective problem-solution performance combining personal beliefs related to health and wellbeing. Each participant is invited to contribute a causal remedy to a common dilemma – be that a disease, nuisance or spiritual misfortune. Remedies can range from natural healing techniques to established medical practices and folk wisdom. Remedies can also be developed into gestural, sung, slam and spoken collaborative form to be rehearsed and performed collectively at will – such was the case with Creole formulation of Remédes Remedies at Le Centre D’Art in Port-au-Prince, Haiti in January 2016. This unique performance was archived as a video. Perejil means « parsley » in Spanish referring to a genocidal event still influencing Haiti today. The tragic Parsley Massacre event took place in the Dominican Republic during the dictatorship of Rafael Trujillo in 1937. The word perejil was used to identify and separate Afro-Dominicans from Afro-Haitians. 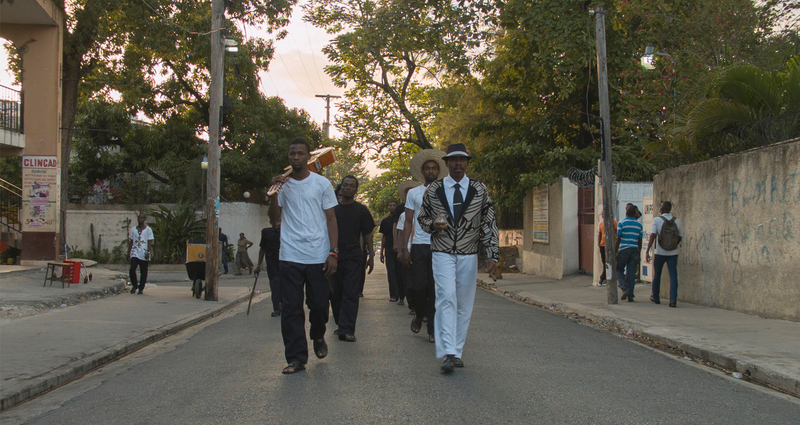 During a multidisciplinary collaboration at the Le Centre D’Art in Port-au-Prince, Haiti, a performance was scripted and produced to be enacted and filmed during a public event in January 2016. The film premieres was at AXENÉO7. Haïti Chérie In response to the devastating earthquake in Haiti on January 12, 2010, I made an intervention on the frozen, snow-covered Baltic Sea. A couple of weeks after the quake, dressed in a custom-made jumpsuit in the colors of the Haitian flag, I made snow angels as a symbol of my mourning, the lost lives, my solidarity and hope. This represents my feeling of helplessness and the pain that I can still feel. The intervention is installed as a video in the larger room at Kluuvi Gallery. I Love JaNY is a portrait of Jany Tomba, the artistʼs aunt, who at an early age, in the 1960s, experienced what it is like to emigrate with her family from the dictatorship in Haiti to New York. Huber was curious to find out what expectations and dreams Jany had, and how the various incidents in her life led her into a career that she knew almost nothing about – that of a successful, ʻearly-generationʼ black fashion model, spending over 25 years with the Ford modeling agency. La Maison d’Haïti is a community and cultural organization dedicated to the education and integration of immigrant individuals and families and the creation and development of close ties with the host society.